A separate bike lane along one of Boston’s most dangerous thoroughfares was constructed using house plants and orange traffic cones. Inspired by a book about “tactical urbanism” and what he called the city’s slow response to making certain roadway improvements, cyclist Jonathan Fertig took matters into his own hands and constructed a separated bike lane along one of Boston’s most dangerous thoroughfares using house plants and orange traffic cones. Now he’s looking to expand the project, and is raising money online to create additional improvised “flower lanes” that he says will keep cyclists and pedestrians safe from cars traveling along the busy corridor. On Sunday, Fertig, who says he commutes daily from his home in Dorchester to Cambridge, placed six potted plants and cones on a portion of Massachusetts Avenue near the Beacon Street intersection, the site of a fatal crash in August that claimed the life of endocrine surgeon Anita Kurmann. “I went to Home Depot, bought the mums that were on sale for $6, and then just put them down and walked away,” Fertig said. Fertig said his act of tactical urbanism — a term used to describe a temporary measure that improves or transforms a city — was driven by motorists using the existing bike lane as a traffic turn lane, and the city’s sluggish efforts to erect plastic posts near the intersection as previously promised. The city said in a Tweet this week that the posts would be installed Thursday. The area has already been repaved, and new striping has been applied. The department “cannot, however, condone the placement of objects in the roadway as doing so may also impede safety,” she said. She said the city would remove the flower pots and cones when the new “flexiposts” are installed. The remaining pavement markings, including painted bike lanes, will be completed in the next few days, weather permitting, she said. 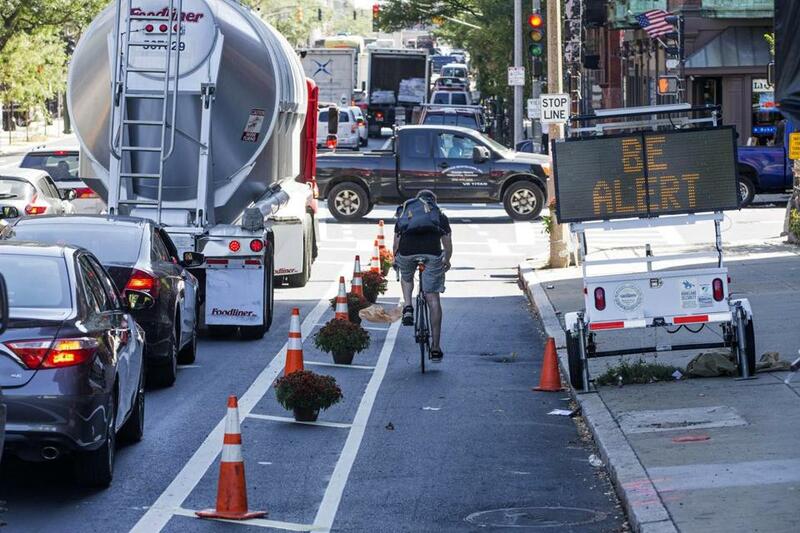 Citing the success of his first endeavor, Fertig launched a GoFundMe.com campaign this week to help pay for additional plants and cones to keep cars from parking in the bike lanes on Massachusetts Avenue. “That way people can’t obstruct the bike lanes. Parked cars present problems,” for cyclists, he said. Fertig’s two-day-old campaign had raised more than $1,100 by late Wednesday afternoon. Based on tweets from cyclists passing through the area, the plants and cones have made a difference. A set of photos shared by cyclist Greg Hum, cofounder of the Boston Bike Party, shows a significant amount of space created between cyclists and large vehicles such as buses by the items placed by Fertig. Not only was Fertig surprised by how fast he was able to raise money for his efforts, he was also shocked to learn that no one has removed or damaged the potted plants. “They seem to be getting a really good response,” he said.